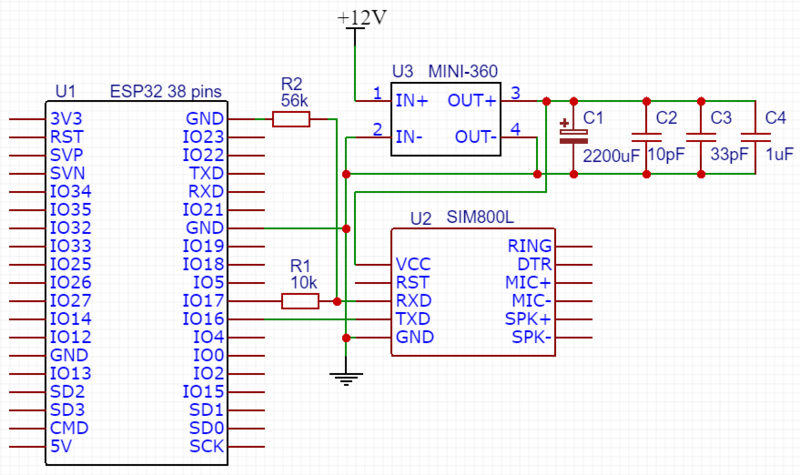 Resistive Divider for RX module input for level matching. The Calculation of the divisor in the previous article. DC-DC step down converter. The scheme used inexpensive module Mini-360 for $0.3. Several Tanks for filtering DC-DC pulsations are step down converter-A. At least this module gets into the mounting board without any problems, as the distance between the "comb" connectors multiple 2.54 mm. The Nuances of working with SIM800 are described in detail in the previous article. Since The SIM800L module I have used in expensive equipment that should work guaranteed, I have added tanks according to the recommendations of datasheet. The Tantalum capacitor on the module is split. I have added an electrolytic capacitor for 2200 Μf and the rest of the tanks by datasheet. The ESP32 Microcontroller In this example was fed from the USB port of the laptop. If you do the conversion of levels in a serious way, then you need to use the board of the level converter, supplied by the microcontroller support voltage 3, 3V, and from the side of the SIM800L the reference voltage removed from the simple chain resistor and stabilitron. Her calculation is here. Stabilitrons happen on 2.7 V and 3 V.
Just the minimum value of 2.7 V. Immediately say-I have not tried this scheme, limited to a simple option with resistive divider. Mini-360 DC-DC Converter is not the best option. It normally withstands the load, SIM800L loaded with it stably, but the quality of the variable resistor is very mediocre. In the Case of vibrations in the production room where the equipment will be placed, the output voltage may "depart" from the set value. So This DC-DC converter will be on the menu for something more quality. However, the module is tiny, so it is easily placed together with the tanks (except electrolyte) and resistors under the module SIM800L. The GSM module was dampened on the connector. A 12 V power supply unit Was used as a power supply on 3A. For the price of 4 USD-just a magical quality. I Took it here. Immediately Note that the powerful 4-port USB charging AUKEY 5V, by 2.4 A on each USB port connected to the power supply for breadboard-A, the load did not pull. At loading of the module there is a peak power consumption and the voltage on the GSM module woke up to 3 V. The Module did not even startanul really. There May be a problem in the BP for Breadboard. He even had no load to give less than 5 V.
The Code was tested on the 38-inch MH-ET Live ESP32 Devkit 38 pins. This piece of code in the project is in the form of a *. cpp file, so simply rename the Init_GSM_SIM800L () function to setup () and add the loop () function.